Spacious aisles. Room to operate heavy machinery. Breton sign hovers over booths. Vitek Laser Systems works on display. One of Prussiani's big machines. 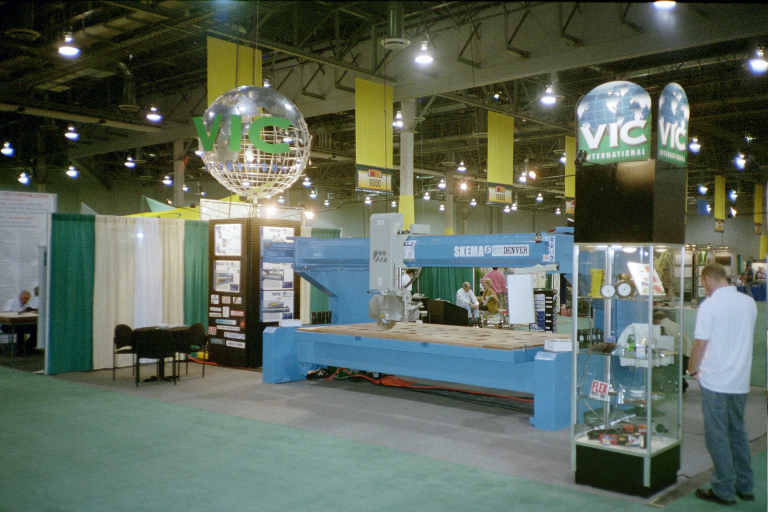 VIC International booth. 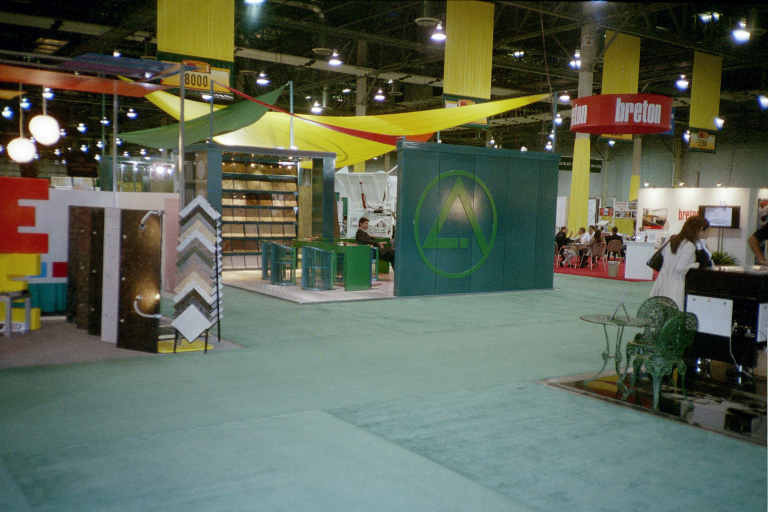 MS International, Inc. booth. 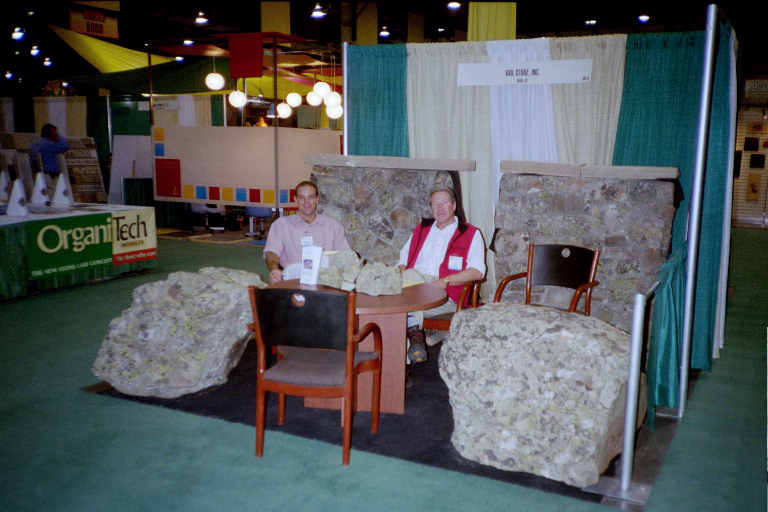 Vail Stone booth. 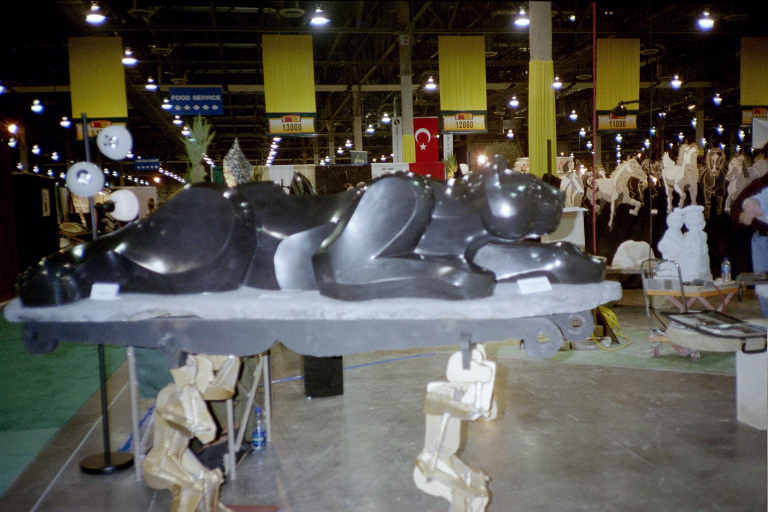 Black marble "Top Hat Panther"
I attended the International Tile and Stone Show (ITSS) held at the Sands Convention Center in Las Vegas Oct. 24-27, 2002. 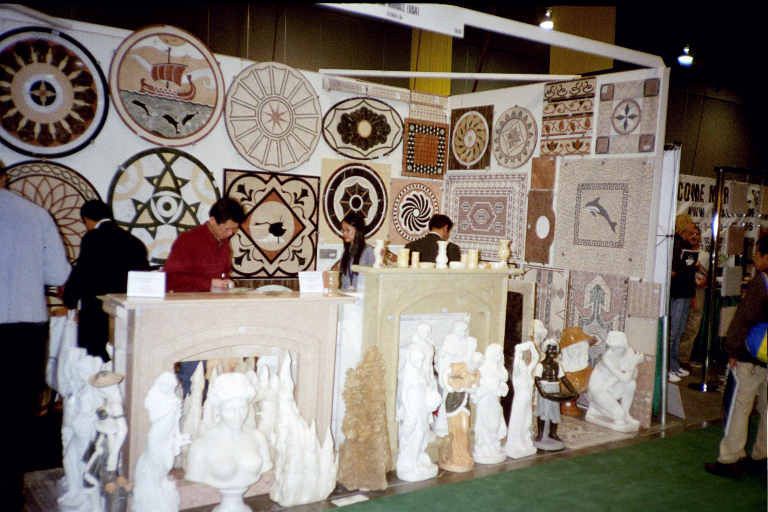 The inaugural show attracted about 200 exhibitors, mostly from the stone side of the trade and from all around the globe. I enjoyed learning about and meeting folks involved in this specialized and rapidly growing segment of the trade. 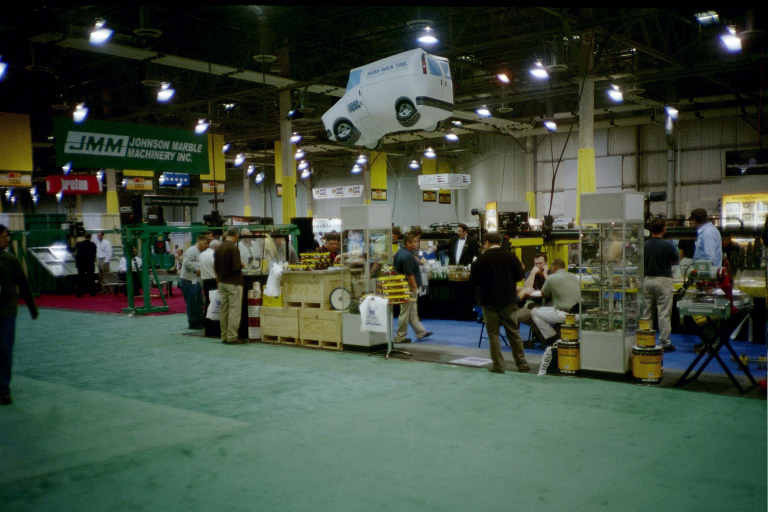 Large machine companies occupied about a fourth of the exhibition space. Companies like AGM, US Granite Machinery , IGE Solutions, Breton S.p.A., and BVH Gregg demonstrated automated equipment. Designed for cutting, routing, edging, polishing, - slabs, countertops, moldings, basins, etc. - these CNC (Computer Numerical Control) machines range widely in price from $5,000 to $50,000 USD depending on capabilities and complexity of the software. 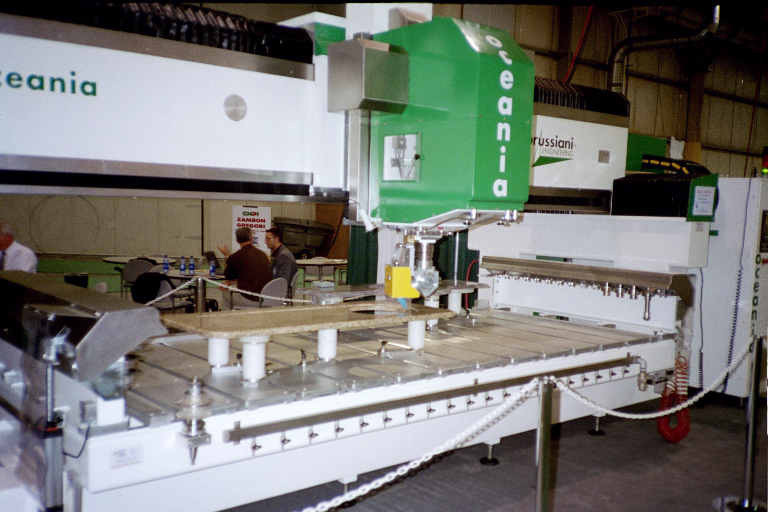 Several software firms exhibited including ETemplate Systems, which featured their ETemplate Photo that uses digital photos to create CAD drawings and templates that can be sent directly to a CNC router. Pinnacle Manufacturing offers a complete business management software system for stone contractors and dealers offering stone countertops. Vitek Industrial Laser Systems' machine works like a printer, but instead of printing, it engraves images, logo, and text in stone, tile and other surfaces. 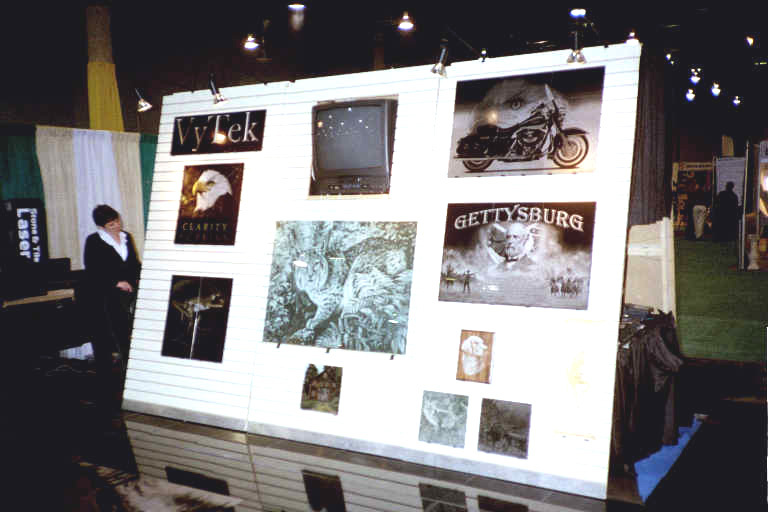 Works on granite, marble and limestone were displayed in the Vitek booth. The machinery, products and installation handling equipment and tools tend to be heavy duty by the nature of the trade. 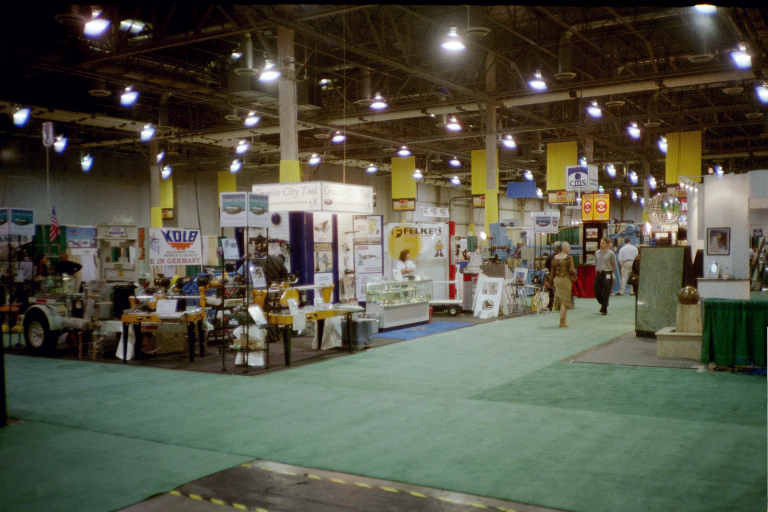 Tool companies that specialize in this market were well represented on the show floor, including Alpha Professional Tools, Trow & Holden, Laser Products, and Tile Eze. The Windy Ridge Corp. demonstrated its versatile "Jet Stik" stoneworking tool. 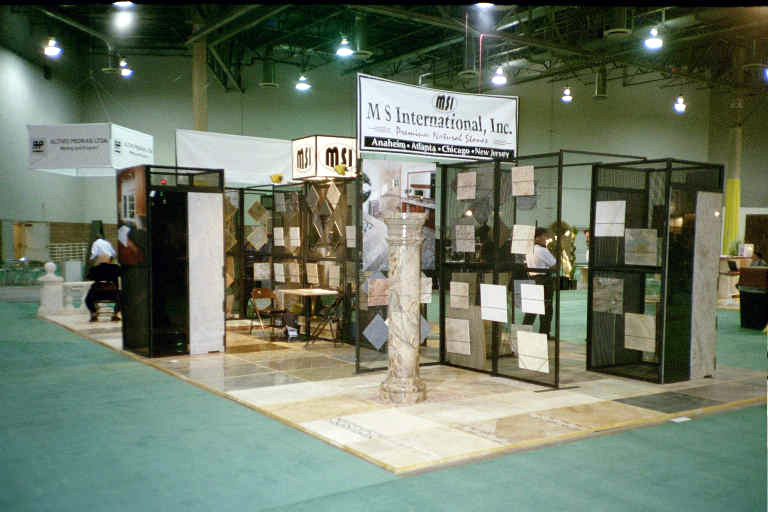 Marble and stone manufacturers and distributors put together some very attractive displays. Ozer International showed its "Living Stones" line from Turkey, CCI Industrial Corp. offered its Natural Stone Collection, Enterprising Enterprises chose granites from India for its booth, and Color Marble showed a full range of products from their Shanghai factory. Other Chinese source companies included the extensive line of the Kai Lim Marble Group, Marble Empire with its new "#1 Verde Butterfly Granite Quarry" slabs, and the unique look of Sun Stone Co., Ltd. products from quarries in the Fujian region. 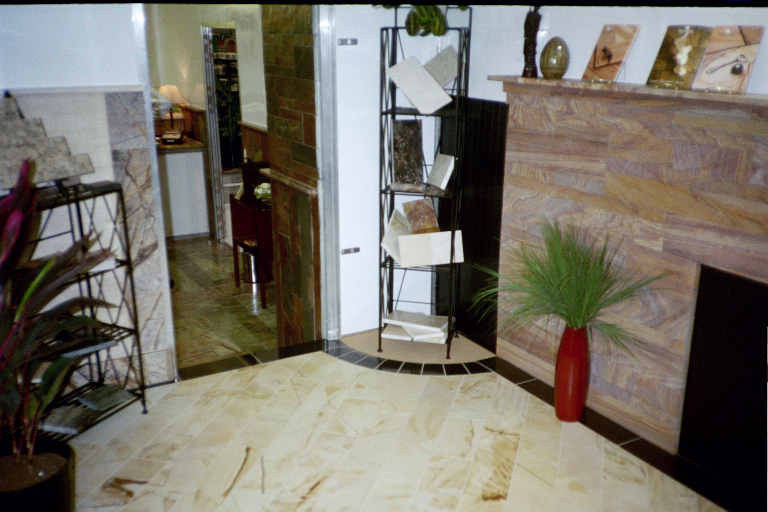 Travertine could be seen at the Quality Marble & Travertine booth and many others. 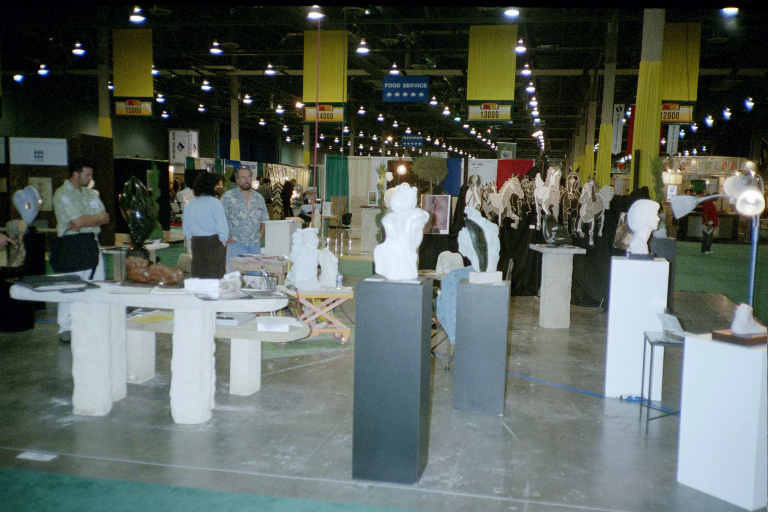 One of the more unique exhibitors was Vail Stone (no website). The company sells moss encrusted boulders and rocks harvested from an alpine forest ranch in central Colorado. Lueders Limestone (no website) distributed business cards printed on 3x3x1 inch pieces of limestone. Italy's Breton showcased their "Terastone Steel" raised floor system. 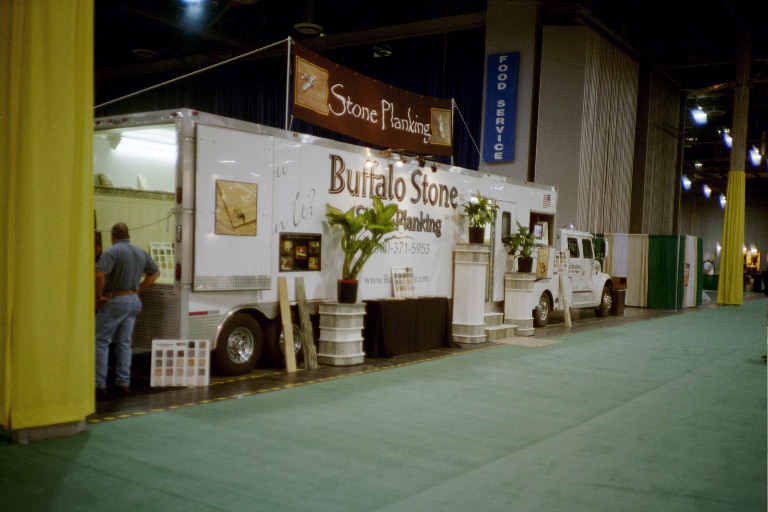 Perhaps most impressive was the "BuffaloStone" Stone Planking traveling showroom, a converted 48-foot freight trailer. Standard 6-inch planks of BuffaloStone are available in granite, slate, sandstone, marble and limestone. Artistry in stone, like sculpturing, was elegantly displayed at the Northwest Sculptors Society booth. Among the artists works displayed was a piece called "Top Hat Panther" by Matt Harvey. It is a full-sized panther hand carved and polished from a solid piece of black marble valued at $75,000 USD. You will find a photo of it in the accompanying pictorial. Media exhibitors serving this market included Stone Business, Stone World Magazine, Stone Magazine, and StoneInfo.com. This year's ITSS show definitely left me with a better understanding of the overall stone industry.